PRINCETON, NJ -- After six messy weeks -- defined chiefly by the partial government shutdown and troubled rollout of the federal government's healthcare exchange website -- President Barack Obama's reputation with the American public has faltered in some ways, but not in others. Most notably, for the first time in his presidency, fewer than half of Americans, 47%, say Obama is a "strong and decisive leader," down six percentage points since September. 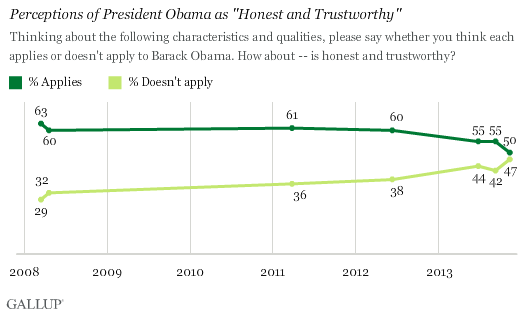 Similarly, the share of Americans who view Obama as "honest and trustworthy" has dipped five points. Exactly half of Americans still consider Obama honest and trustworthy, but this is down from 55% in September and 60% in mid-2012 as Obama was heading toward re-election. Americans' confidence in their chief executive to manage the government has also waned five points since September, to 42%. However, this level is similar to 44% in June and 45% in June 2012. 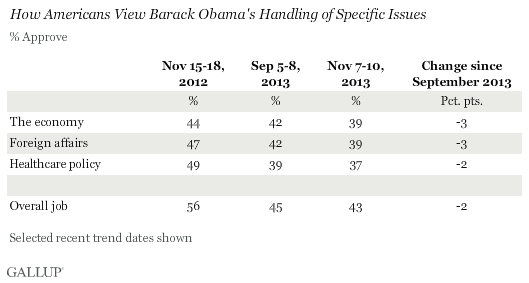 On the positive side for Obama, more than half of Americans -- 54% -- continue to believe he appreciates the problems Americans face in their daily lives, down only two points since September. And while far fewer than half -- 38% -- say he has a clear plan for solving the country's problems, this is typical for Obama, as well as for most recent presidents. These results are based on a Gallup poll conducted Nov. 7-10. In contrast to Americans' ratings of Obama's personal characteristics, their ratings of the job he is doing in handling the economy, foreign affairs, and healthcare policy are each down compared with early September, but not significantly. This may be the best Obama could hope for in light of recent events and the decline in Americans' perceptions of him as a strong and decisive leader. Still, the 37% approval for healthcare and 39% for the economy and foreign affairs are hardly ringing endorsements, the last of which comes at a time when the Obama administration is conducting high-profile negotiations with America's longtime adversary, Iran, in an attempt to prevent that nation from acquiring a nuclear weapon. Notably, all of these issue approval ratings are worse than Obama's overall job approval rating, which was 43% in the same poll, and has averaged 41% during the last two weeks of Gallup Daily tracking. Gallup measures that track the way Americans see Obama personally, and as the nation's chief executive officer, help document how recent events have affected the president's image. Despite the embarrassing failure of the government's healthcare exchange website, Obama's job approval ratings for his handling of key areas of the government, most notably the economy and healthcare policy, are largely unchanged. On character dimensions, Obama does not receive high ratings for his perceived managerial skill or policy ideas, but these figures have been anemic for some time now, and show little change since September. Of more concern for the White House, Obama's once-positive image as a strong and decisive leader has suffered, in addition to his longtime reputation for being honest and trustworthy. 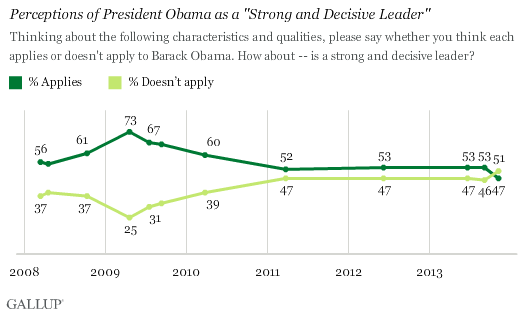 Of these, the decline in Obama's honesty rating may be the most noteworthy because Gallup has previously found that this dimension is one of the most important drivers of his overall job approval. Thus, the recent controversy over whether the president honestly described Americans' ability to retain their own healthcare plans under the Affordable Care Act could have the most significant implications for his presidency.